Once again, you can transfer your American Express Membership Rewards points over to Virgin Atlantic to spend on a round trip award on ANA in First Class with a 30% bonus on the transferred points. The gist is that with the 30% bonus, 85k MR from the west coast or 93k MR from the east coast transfers gives you the 110,000 – 120,000 Virgin points required for the trip. Before you transfer, be sure to check availability (use United or Air Canada or ANA’as own website to check) and then call Virgin to put the flights on hold while you transfer. They can hold for 48 hours. It’s a great deal. I was ecstatic when I used 160,000 AA miles to book a $29,000 ticket on JAL last winter. And if I thought I’d be going to Asia again anytime soon, I would definitely make this work. It’s almost half the price I paid in miles!! 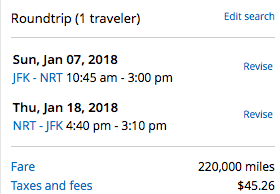 To put a fine point on this, a First Class round trip from NYC to Tokyo using United Airlines Mileage Plus miles would cost you a whopping 220,000 miles. Using this deal, you can get it for 93,000 Amex points. You’ll need to find availability before calling Virgin Atlantic to put the flights on hold and I recommend the United website for that. Search the calendar view for premium availability and then look day by day for the ANA flights. Note you do have to book a round trip for this deal to work – so find flights both ways before calling. I won’t personally do this transfer right now (despite tremendous temptation) because a) I don’t have the current need and b) one should ALWAYS remember that frequent flyer programs can and do change (almost always for the worse). So don’t do the transfer thinking you might one day book the flights – because the Virgin / ANA redemption could change or go away. Remember that, last year, Alaska Airlines doubled their redemption chart for Etihad with zero notice. If you are going to do this, also read JT Genter’s post at the Points Guy which spelled this all out in a rather elaborate post. Will you book this deal? Let me know here, on Twitter, or in the private MilesTalk Facebook group. The last time Amex had this deal, we each transferred points to VA to equal the 95K needed to fly VA upper class RT from US – UK. We had already booked one flight US – UK, and after taking that my wife decided she didn’t like their seat configuration, so we decided to use those points towards the ANA trip. On another separate note that you may want to use – the VA card gives 20K points signup for the $95 AF and one purchase. 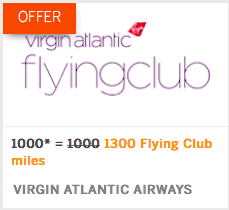 Very much the same as the Barclay AA 60K card, only for less miles. The advantage to that is that a person could fly off peak one way from the US – UK on VA for 17.5K points in PE. VA has a great PE product, 21″ seat with a 38″ pitch. I would name the article, “Fly to London for $95 and a pizza”. Whatever, if you can use it go for it.